Having fresh herbs in the kitchen is easier than you might think. There are plenty of plants that sprout roots and start growing new leaves the moment you put them in water. Here is a list of the eight best plants you can grow at home over and over. Now you’ll have an endless supply of fresh herbs and vegetables! 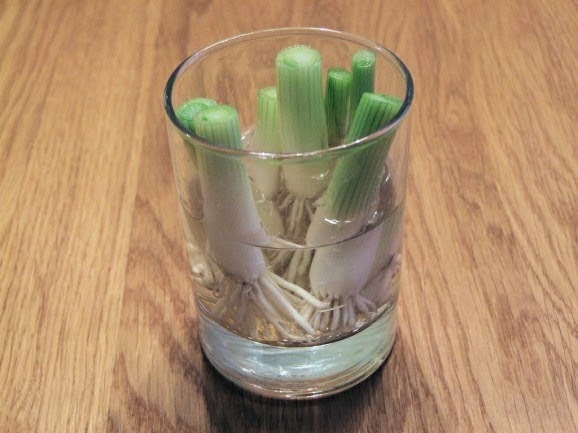 Spring onions start growing if you leave the roots submerged in a small glass of water. Just remember the room you leave it in should be well illuminated. Garlic will easily sprout roots and grow quickly when left in water. Its shoots have a very distinct taste and make a great addition to any meal! Submerge the roots of bok choy in water and leave it in a well-lit room. Leave it there for up to 2 weeks and then place it in a pot. It will then grow into a full-sized cabbage. If you want to re-grow carrots, all you have to do is chop off the top and leave it in water. It will soon start to sprout into a carrot. When they reach about 4 centimetres, place the basil in a glass of water and leave it directly in the sun. Once it’s doubled its size, replant it in soil and you’ll soon have fully-grown basil. Chop the celery off at the base and place it in glass or cup in warm water. Leave it in a sunny room and leaves will start to grow. Then replant it in soil! Submerge the bottom half of this lettuce in water and let it stand for a few days. Once new leaves start to grow, replant it in the ground. Coriander is another plant that grows well once submerged in water. Replant it after a few days and soon you can enjoy its aromatic flavors!